TUC 2018 DAY 1 Report. Fishing tackle retail and wholesale in Europe (EU) - Angler's Zone. Fishin news, new and proved tackle reviews, warehouse news, fishing events, fishing videos and photo gallery - all this content we present at Angler's Zone Blog. "Angler's Zone" company. "Angler’s Zone" does much more than just static distribution of products. We spare no effort to ensure adequate understanding and utilisation of the real purpose of the product and its specifications as well as appreciation of the manufacturers’ concepts. Our aim is to inform the final user about all the product’s characteristics, exceptional features as well as the purpose and possibilities of use. So, read our blog and be informed! From 2013 - Chief of Commetee, main organisator of Trout Union Cup - International project of making sport spinning fishing tournaments, based at international rules, where only trouts are objects of fishing. Since very young age, even before school, love in nature, rivers and fish were born. Taking rod in hand a way of life was chosen. Finally, Day 1 of competition arrived! Venue was ready restocked with 400 kg of brown trout who just wait for first signal and start of competition. Size of fish is about 120-150 grams so population was about 2500 trout's. More than enought for 14 teams, to ensure excellent conditions for all. Great sunny wheather but with cold autumn morning marks Trout Union Day 1 this time. After the last storm and flood from Czech Republic with heavy rain, sure is huge positive thing. Wheather for competitors wasnt a problem but heavy wood shadow keeps trout's invisible and polaroid glasses didnt help this time. Except obviously boxes competitors should listen their intuition. Even trout's where brown trout's, in start their behavior was similar to rainbow trout's, not by migration, by gathering in shoal. While tournament passes more and more they spread. Sector A was a sector with smallest number of catches becouse the sector is mostly equal, streams between huge rocks, but provide similar conditions to everybody. 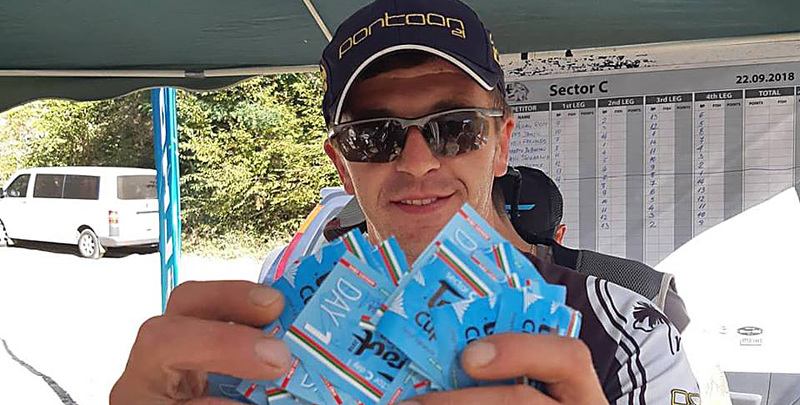 Bulgarian team member Todor Kostadinov and International 1 team member Ivan Kontrabakov uses knowledge of river configuration and took 2nd and 3rd place. Very pleasant suprise was Darko Pertot from Serbian team who won the sector with enought 0,5 points in front of Bulgarians. In opposite, sector B, right above A gives largest numbers of catches during all 4 sessions. Very good river configuration, as expected ''hold'' the fish in it. Excellent skills and knowledge of Trout Union medalist and our field organizer Georgi Getov won again with incredible 61 catch. Sector C was one of the most problematic sectors. It's configuration, stream at start and stream at end of and middle with steady water was increadible heavy, so competitors catch very different number of fishes by rounds. 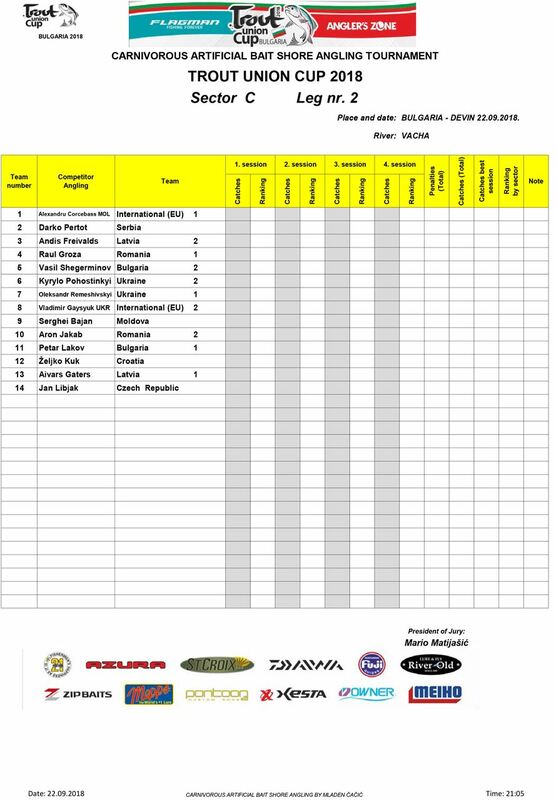 Here was established a record of Day 1 in number of catches – Matijašić cought 44 fishes in 45 minutes. 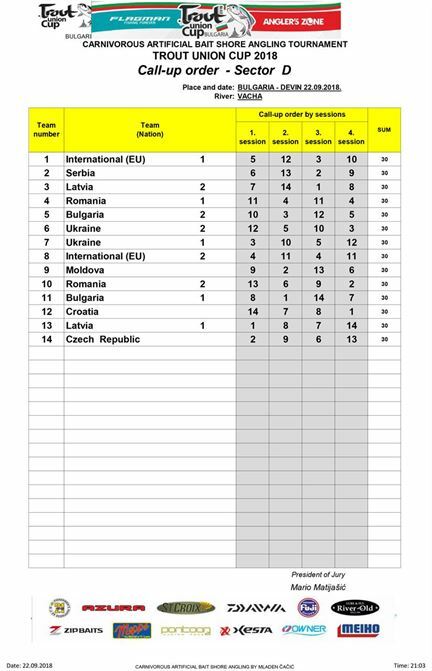 Also, it was a bad day for Romania team member Roberto de Bertoli who without any bad purpose put hook with barb and judge find it at checking. Very bad day for him in, of course, thinkings that similar can happened to any competitor in just moment of dispersion. Sector win is taken by Czech Republic team member Dan Kop who shows us today huge Fair play spirit in few different situation. We can only say: Bravo Dan. Winner of sector D is Ukraine 2 team member Iurii Kotsuba with huge 51 cathes. 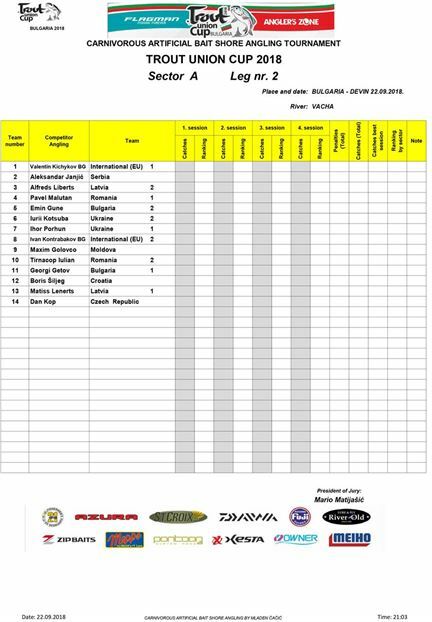 He is followed by Lubomir Boyadziev, very experienced Vacha river fisherman from Bulgaria 2 team member and also domestic fisherman Nikolay Kostadinov from Bulgaria 1 team. Excellent day for Bulgaria 1 team, they stand convincingly on 1st place with just 9 points. They are followed by very good Czech Republic team and Ukraine 2 team. As we know, our discipline is very fickle when talking about results so many teams are still in game and tomorrow is a new day of opportunities. 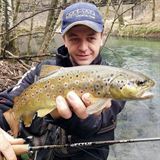 Vacha river is restocked with another 250 kg of fish and everything is ready to get new Trout Union winner! 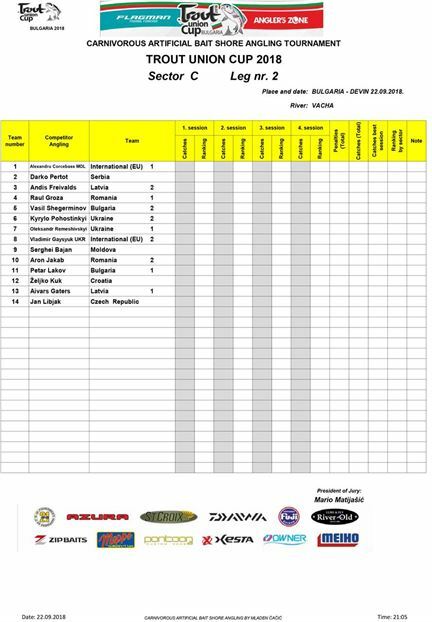 23 September TUC 2018 FINAL RESULTS! 19 September UPDATE! TUC 2018 - list of competitors for Trout Tournament! 31 August Trout Union Cup 2018 - again in Bulgaria! Trout Union Cup 2017 - Anounce and Invitation!